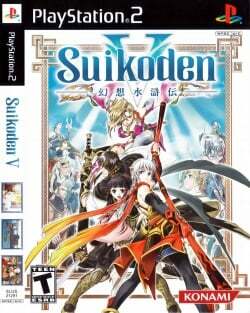 Game description: Suikoden V, like its predecessors, features unparalleled in-depth gameplay, a riveting storyline as well as the series' trademark 108 Stars of Destiny. Thrust into a time of unbalance and unrest, a dynamic drama unfolds revolving around one of the 27 True Runes, the Sun Rune. Players are tasked to explore the lands of Falena, gather allies and become stronger to ultimately bring back peace and prosperity. While on their quest through rich 3D environments, exciting new secrets of the Suikoden world will be revealed. The game features significant enhancements from all the previous installments of the series, including 6-member battle parties, multiple mini-games and the homebase system, where all of your allies gather together along with new features to create a unique gameplay experience like no other. Loosely based on a classical Chinese novel, Shui Hu Zhuan by Shi Nai'an, Suikoden V centers on the political struggles of the Queendom of Falena, and takes place 6 in-universe years before the events of the first Suikoden. The player controls the Prince of Falena and travels the world, acquiring allies and dealing with the problems of the nation. The game features a vast array of characters, with over sixty characters usable in combat and many more able to help or hinder the Prince in a variety of ways. Europe v02.00(14/06/2004), Defaults + MTVU (Multi-Threaded microVU1), Run at full speed (60fps) with custom resolution 1920x1080 without any slowdowns. Description: There is a minor graphical issue with an ugly white line running through every text box. Workaround: This is apparently a result of upscaling and seems to be unavoidable without using native resolution. See this thread for an example and possible suggestions. This page was last edited on 13 April 2019, at 22:52.